The very best wedding bands in the Somerset area all fronted by Adam Chandler. Just because Somerset seems slow and restful, your Somerset wedding music doesn't have to be! Call Adam Chandler today, and set the perfect pace for your celebration. Adam Chandler – setting the tone for Somerset weddings.. Somerset is a county of highs and lows, soaring peaks and welcoming plateaus. All of this, along with whoever you are as a couple and as individuals, can be represented in music – and Adam Chandler's musicians are some of the best at drawing pictures with sound. 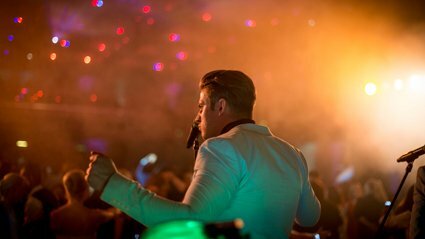 With over ten years' experience offering music that ranges from lounge to light show, contemporary to classic cool, Adam Chandler and his wedding musicians are the first and last names in style, elegance, sophistication, and memorable performance. Whether you're looking for a bold big band, or the sweet, subtle strength of a solo wedding singer, you need look no further than Adam Chandler. Why not raise a toast of Somerset cider to the fruity, punchy notes of wedding music from the best in the business? Just as cider says Somerset, so Adam Chandler says wedding music. From Glastonbury glamour to Cheddar cheese, with mystical melodies and all the classics of high school discos through the ages, Adam Chandler's range of music and musicians can blend with Somerset, and with you, to create a perfect, rich, and seamless tapestry of place and personality. Whether your wedding is about myth and magic, history and adventure, or contemporary experience and future expectation, Adam Chandler has the bands and the sounds to bring you and your guests exactly what you want. When you're getting married in the county of contrasts, make sure your wedding music recognises the contrasts of the place, and the contrasts of you as a couple. Make sure it's from Adam Chandler. More Wedding Bands in Somerset! Wedding Bands available around Somerset and beyond!